The Swing Cats - A musical timeline of swing classics from the 1920's to the modern day. Featuring the music of Louis Armstrong, Fred Astaire, Bobby Darrin, Andy Williams, The Rat Pack, Michael Buble, Paolo Nutini and more. Never before has a show captured the full evolution of swing music like this. From its birth in the 1920's to the big band era of the 30's and 40's. From the golden age of the 50's and 60's with household name's like Sinatra, Bobby Darrin, Andy Williams to the modern era of Buble and Nutini. 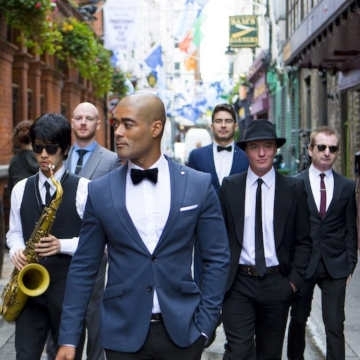 The Swing Cats lead by award winning vocalist Luke Thomas have amassed a huge following throughout Ireland and Europe thanks to their distinctive sound and style which is steeped in the golden age of swing music. They have soldout every major venue in the country including Dublin's Olympia Theatre, Vicar Street and National Concert Hall. They can count Irish President, Micheal D. Higgins as one of their biggest fans and have been requested to perform at his residence 4 times... Most recently Luke and the band secured their first 1 hour TV Special which aired on Oct 27th on Virgin Media Two and featured Phil Coulter and Paddy Cole.